Apparently, while Democrats had a sufficient majority in the Senate and the House to pass the proposal and get it on the ballot without Republicans, several Democrats and all Republicans in the House opposed the progressive income tax, such that the votes weren’t there to pass it. Rather than cast votes for a doomed tax increase in an election year, Democratic leadership elected simply not to call a vote on the proposal at all, much to the chagrin of the progressive tax’s supporters. The proposal in question today was a constitutional amendment that would have allowed a progressive tax in Illinois, as well as a specific rate structure. 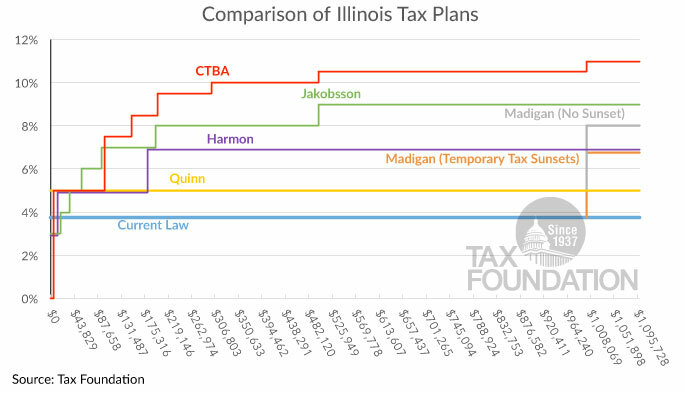 I’ve offered a comparison of all the major tax proposals in Illinois before. The final proposal that failed yesterday, and on which advocates of a progressive tax pinned their hopes, was the purple line representing Harmon’s proposal in the graph below. I wrote several weeks ago that Madigan’s millionaire tax had stalled. With other progressive tax plans now out as well, the debate facing Illinois policymakers is narrowed to two options: maintaining the current law rate of 3.75 percent in 2015, or raising future taxes by making the temporary 5 percent rate permanent (blue and yellow lines below, respectively). Governor Quinn has called for making the 5 percent rate permanent, so doubtless this tax debate will continue well into the election season. As a reminder, we’ve written extensively on Illinois in the last few months. We found that a move to a more progressive tax code has no association with healthier state finances or lower inequality. Before that, we presented data on the filing structure of Illinois businesses, showing how tax increases, progressive or not, affect the majority of Illinois employers. And all the way back in January, we discussed how a move to higher, more progressive taxes would hurt the state’s business tax climate.